It seems to me the C-HR is a victim of its own design. The initial Scion concept stirred up some interest with it’s over-sized 21″ wheels and pancaked roofline. Like so many aspects of concept cars, the form takes precedent over the function. In an attempt to retain likable elements of the concept car, it seems Toyota’s production model sacrifices some functionality for aesthetics. Toyota offers any interior you want in the C-HR, as long as you happen to want black cloth. The headroom is good, but there’s a shortage of legroom in the car. You can get two adults in the rear seats, but you can’t really open the glovebox all the way with a person in the passenger seat. It also feels narrow between door panel and console. If I could sum up the interior in only one word, it would be rubbery. However, there is room behind the rear seats for groceries. Exterior design is a mash up of gills, vents, bulbous lights, and creases in the body lines that depart at odd angles. If they sought to do something beautiful I’m afraid they missed the mark here. It’s not easy to design a car, so in an effort to pay the looks of this car some sort of friendly compliment, I scribbled the following line in my notes. “The front fascia looks like a satisfied cat drawn by Ghibli Studios, and isn’t that bad.” There, now this article is fair and balanced. Perhaps the most tragic thing about the appearance of the C-HR is how similar it is to another compact crossover, the Nissan Juke. For instance, the rear door handles are integrated into the body work, the B-pillars are blacked out for that “hardtop” look, there’s a spoiler/shade over the rear window, and the headlights and taillights creep from the ends of the car to the adjacent body panels. 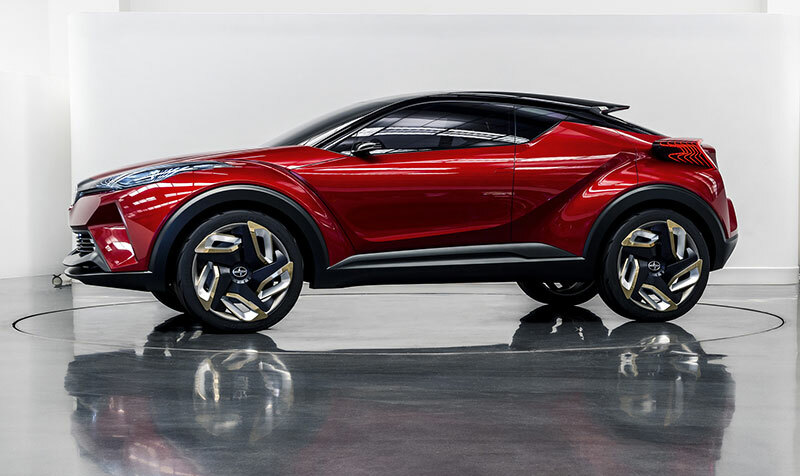 If Toyota sought to make a statement with this car, Nissan beat them to it by six years. When you slip the car into reverse, you may look to the seven inch touch-screen display mounted in the dash for a backup camera. This is wrong. Instead you must squint into the rather small and grainy picture that appears in the rearview mirror. Or you could try a more old fashion approach. Twist around and peer over your right shoulder and try looking out the back window. You’ll find that this is no great improvement over the tiny image in your rearview. Toyota gave the C-HR a decent sized rear window but it’s slanted at an angle that makes it ineffective at almost anything other than keeping the rain out of the car. Presumably this was to try to maintain the silhouette of the original concept. You can try getting a better angle by unbuckling and contorting yourself out of the driver’s seat, but do so at your own peril. The seatbelt reminder chime is unbearable and gets progressively more intense. It’s like a psychological warfare device borrowed from a Guantanamo Bay, used to crack the toughest nuts. In addition to the unusual rear window arrangement, the C-HR features very wide C-pillars which translates to big blind spots. Power is derived from a buzzy 2.0L 4-pot which gets the job done, but without much zest. The brake pedal has an unsettling mush to it. I found myself slightly over-shooting the white line at intersections until I got the hang of it. The car is a little noisy inside but that’s not so uncommon for cars in its price range. The electrically assisted power steering does have a nice feel though. To paraphrase a quote from the great “Red Green Show,” “If they don’t find you handsome, at least they’ll find you handy.” This car is neither. It’s an unremarkable car in a saturated market. It’s for Toyota brand-loyalist who want to send their daughters to college in a shiny new compact crossover. If you happen to be reading this while waiting for a car salesperson to return with the figures on your daughter’s new C-HR, don’t panic. Just take a deep breath, get up from the finance table, and drive to the closest Subaru dealership. The Crosstrek has CarPlay, it’s better looking, less expensive, more capable, and you can actually see out the back window. Yeah, nice entry mate. Let’s follow, and share each other to grow together. Thanks!